It is with great pleasure that KÖNIG GALERIE presents the oeuvre of the Berlin artist Corinne Wasmuht, here on display in the Gallery for the first time in a solo exhibition. On show are several panel paintings in oils on wood, among them the large-format, panorama-like work Calafate, 2014. 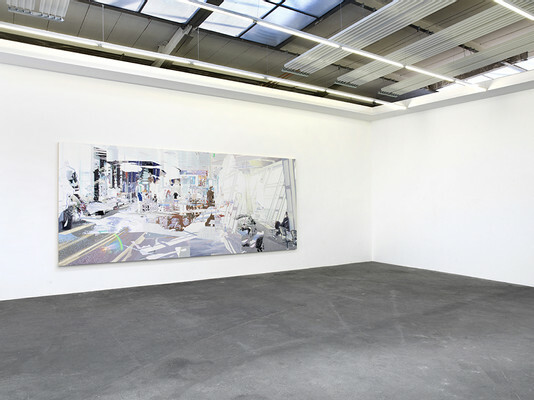 A thread running through Corinne Wasmuht’s work is her ongoing concern for the inherent properties of light and space. Often, the light seems to shine from a source external to the painting; sometimes, the painting glows from within itself; and then again light sources flash out as inverted dots, as with the negative of a colour photograph. 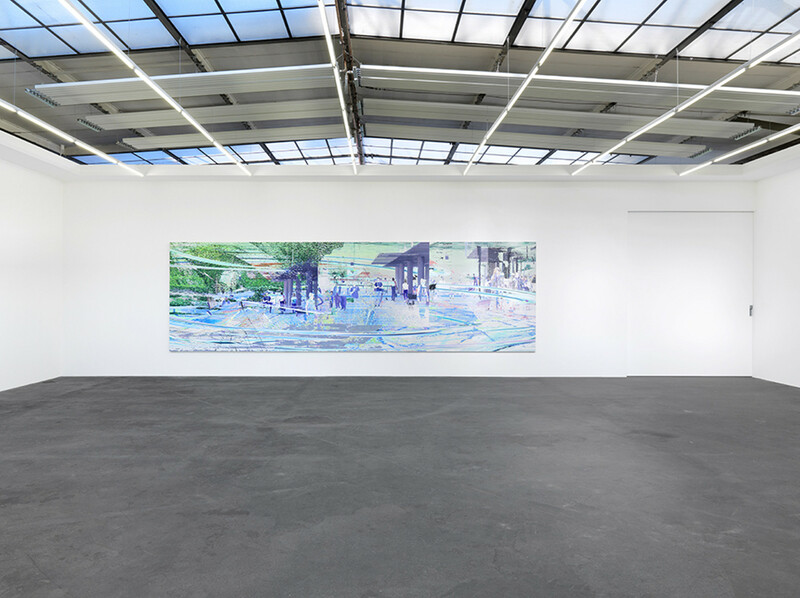 The spaces determined by central perspective are broken apart, re-assembled, thrust into and over one another and transposed into abstraction – as if the artist were subjecting a material to a range of stress tests in a research facility. The result is a visual atomization, a pulverization, a flickering and shimmering. The new works presented in the current exhibition continue the engagement with these overriding foci of interest: dazzling light falls into a space (which itself seems to be made up of diverse spaces), casting shadows and refracting as in a prism. What optical equipment (or equipments) does one use when looking at these pictures? And what kind of space (or spaces) does one have here? Everywhere there are clues, but nowhere is there an answer. When, at the beginning of the 1990s, the Parisian anthropologist Marc Augé set about sketching an ethnology of loneliness, he pointed above all to modern places of transit – shopping malls, airport terminals, never-ending motorways. According to Augé, these parts of the built environment are defined above all by their indeterminacy: " Place and non-place are rather like opposed polarities: the first is never completely erased, the second never totally completed; they are like palimpsests on which the scrambled game of identity and relations is ceaselessy rewritten. "These places/non-places are the concomitant of what Augé describes as surmodernité ('hypermodernity' or 'supermodernity'). Since that time, with the digitalization of the world, the felt dissolution of time and space has proceeded yet further. How can change be grasped in an accelerated present? How can one establish one’s position in this new hyper-artificiality? Where are the new co-ordinates and points of reference? Herein lies the topicality of Wasmuht’s art – an art that challenges its beholder to find orientation and bearings in a space beyond familiar regularities. Light has a speed of its own: in contemplating these pictures, one can learn how to think space anew. Wasmuht, born in Dortmund in 1964, is living and working in Berlin and Karlsruhe. She studied painting at the Kunstakademie Düsseldorf. Since 2006 she has been appointed to a professorship at the Staatliche Akademie der Bildenden Künste, Karlsruhe. As an awardee of the Käthe Kollwitz Prize she showed her work lately at a solo exhibition at the Akademie der Künste in Berlin. 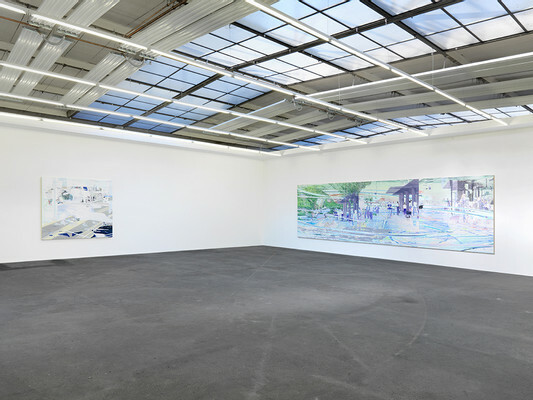 Furthermore she exhibited solo at the Kunsthalle zu Kiel(2014) and at the Friedrich Petzel Gallery, New York 2012, the Kunsthalle Nürnberg (2010), the Kunstverein Hannover (2006) and at the Kunsthalle Baden-Baden (2003). In 2011 she participated at the 54th edition of the Biennale di Venezia. Her works are represented at international private and institutional collections, such as the Albright Knox Art Gallery Buffalo, the Städel Museum in Frankfurt am Main or the Kemper Art Museum San Louis.